Depending on what they say, Yelp reviews about your business can bring customers in or scare them away. 74 percent of the consumers searching online for a local business turn to review sites like Yelp. Review sites also drive higher conversion than search engines and social networks. Moreover, 92 percent of consumers make a purchase after visiting Yelp at least sometimes, frequently or almost always. These numbers go to show that many consumers are finding your business online and making a decision about whether or not to spend money with you based on the information they see on Yelp. You can manage this information and influence consumer behavior by tracking Yelp reviews. When you track Yelp reviews on your Yelp business pages, you can gain valuable insights into the ways you are wowing your customers, along with the areas that you can improve on. Proactively monitoring online reviews on your Yelp business page can also provide ideas on how you can boost your visibility on the review site, improve your business reputation, and engage more effectively with Yelp users and potential customers. Beyond manually visiting your Yelp business page and reading, one by one, the reviews posted by your customers, it can be tough to keep track of Yelp reviews and gather insights from this important review channel. It’s even more challenging if you are running a business with multiple locations. You can create or claim your business on Yelp through the Yelp for Business Owners page. When you have gone through this process, you’ll then be able to log in and track Yelp reviews, read what your customers have been saying in their reviews, connect with the Yelp community, and respond to reviews. 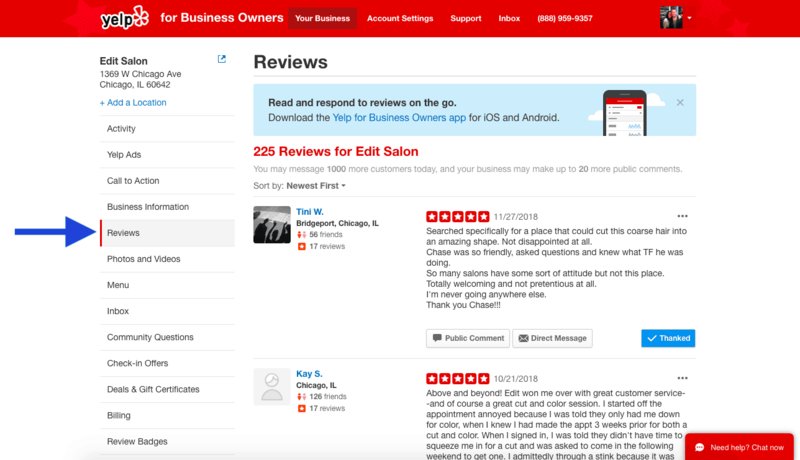 To see your Yelp reviews using Yelp for Business Owners, simply log in and click the Reviews tab. Apart from reading each individual review, you’ll also be able to respond to your Yelp reviews with a public comment or a direct message. Or you can simply press the Thank button to show your appreciation for customers who took the time to review your business on Yelp. You can find these response options under each individual review. If you don’t have a lot of time to sit in front of a computer and track Yelp reviews, you can do so on the go using the dedicated Yelp business owners app. Yelp’s business app can help you do more than just track Yelp reviews. You can also get data about your user views, customer leads, and other activity on your Yelp Business Page. Yelp advertisers can also see their Yelp Ad clicks. Working with a review management company like ReviewTrackers can be a great way for multi-location businesses to save time and gain actionable insights from their Yelp reviews. ReviewTrackers is a review management and customer experience platform that helps brands like US Bank, American Family Insurance, and Legoland leverage reviews and customer feedback to inform better business decisions and improve the customer experience. Through a single dashboard, ReviewTrackers users can access features like Yelp review tracking, review response, review monitoring and review notifications (across Yelp and 100+ other sites), sentiment analysis, customer feedback campaigns, review widgets, and more. It is evident that Yelp reviews as well as reviews on other sites significantly influence the way customers think about your business. By finding ways to track Yelp reviews of your business, you can keep a close eye on your online reputation, increase your business’ awareness of important customer experience issues and trends, and minimize the impact of negative reviews.